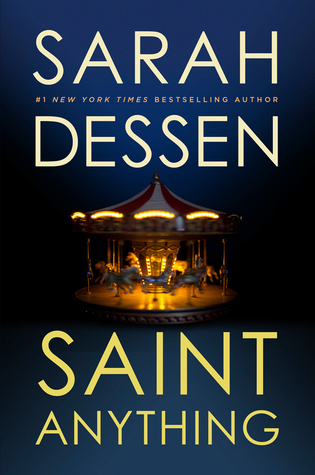 Last year, I read a lot of Sarah Dessen, not all of her backlist, but most of it. While I enjoyed it, none of the books overly shined to me, this may be because I read a lot of them in a shot period of time and they started to blend together to me. Saint Anything is completely different, it stands out and is completely by itself and I adored it. Saint Anything is the story of Sydney, the second child in a family who was never seen because her older brother always was the star. She was fine with this life, she really didn’t want to be seen, she enjoyed her life with her two friends at her school, Perkins day. Life was on a path that she had expected. What no one expected was her brother to drive drunk, get a conviction and the guilt that would then follow Sydney around. She ditched her fancy private school for public and tried to work through the guilt and the grief. What she didn’t expect was how hard it would be and how the world all of a sudden because Sydney vs the world. The world of course, being her parents, mostly her mother. Her father, while he loves her, is often absent with work, her mother took the role of June Cleaver very seriously and she excelled at it. The problem with this though, is that her mother spent all of her time focusing on Peyton, and when Peyton went to jail she continued to focus on Peyton, but Peyton in jail. Sydney was still never a thought to her. Sydney really just wants to be seen and I understand that. At 26-almost-27, there are days I would like someone to notice. But Sydney realized something that I did a few years ago: it’s okay to create your own family. And she does. One day she walks into a pizza place by her new high school and becomes friends with Layla, her brother Mac, and their family. They seem to get her. They get the guilt that she is covered in and they let her talk. Not only do they let her talk, they let her listen. Lately, I’ve been enjoying books that have strong female friendships. This is probably because I take my friendships seriously and I work hard at them and what I enjoyed throughout Saint Anything was although Sydney switched schools she still worked at the friendships she had from Perkins Day. Not only that when things changed, as friendships do, she still tried to make it work. Same goes for her friendship with Layla, they were both fiercely protective of each other and while there is a painful moment, they work through it. Like friends do. There was one part I did not enjoy, and that was a part with Mac, where he proudly wore this medal as a reminder of being the fat kid and how it was the worst thing. Now he eats horrible tasting food, but at least he’s skinny. Would Sydney have liked him if he was fat? Would it have been the worst thing if he was fat? It was the only thing that stuck with me for awhile, that a month later had me coming back and editing my review. 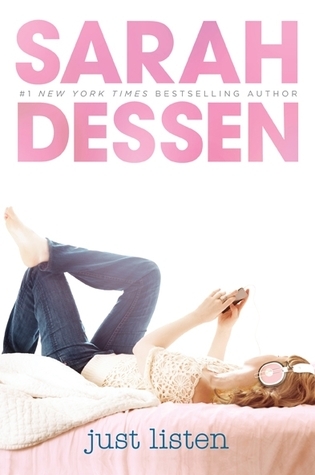 I, of course, enjoyed how Dessen brought in hints of her previous books that make it quintessential Dessen. Although this was a departure from her previous novels, it is still the Dessen we know and love. Since her parents’ bitter divorce, McLean and her dad, a restaurant consultant, have been on the move-four towns in two years. Estranged from her mother and her mother’s new family, McLean has followed her dad in leaving the unhappy past behind. And each new place gives her a chance to try out a new persona: from cheerleader to drama diva. But now, for the first time, McLean discovers a desire to stay in one place and just be herself, whoever that is. Perhaps Dave, the guy next door, can help her find out. The more I read Sarah Dessen the more her books run together. I’m not saying this is a bad thing, I just believe that I would have enjoyed these more if I would have spread them out a bit more. Of course, I regret nothing. What Happened to Goodbye is the story of McLean, a girl who is constantly moving and constantly making her life over every time her and her father move. Her father and her mother divorced after her mother slept with the local basketball coach and ended up pregnant. McLean feels that she no longer fits in with her mother, and her mother’s new family and she is happy to move around with her father. Create her new self. She hates being not part of her mothers family, but it hurts too much to act like nothing has changed. Her mother tries, she tries to reach out but McLean needs a break. She wants to be her own person, who’s mother did not break her heart. McLean also hates the fact that her mother is constantly trying to control her. She wants a break from that also. From McLean’s point of view, her mother wants everything to be the way it was, and it will never be like that again. McLean is too upset about the situation. Her heart hurts too much. Something has changed this move though, McLean did not change her name this round. She stays McLean, she doesn’t create a new persona and she’s slightly confused and shocked by this. Her father is equally shocked by this, she is finally fine being..herself. What she doesn’t expect is how much this small down changes her. The people, the place, and herself, go through some growing. My heart went out to McLean throughout this novel. She’s bitter at her mother, but she also misses her mother and what was their life together. I understood, because while my parents are happily married, we didn’t always get along for part of my life and while I miss what was, I actually enjoy our current relationship far more than our previous relationship. McLean tried to make the best of a bad situation, but for her that was easier said than done. While her mother is trying and trying, McLean is very much a brick wall towards her mother. She is trying to form other relationships and friendships, including her next door neighbor Dave. Who is a brainiac that should be in college, but is trying to be as normal as possible. This book was very organic to me, nothing that Dessen wrote seemed forced. McLean just wants her mother to state that her mother messed up her life. But through a cast of characters, including probably my new favorite Deb, Dessen created a solid novel that made me from feeling ambivalent about this novel to wanting more. I have been marathoning Sarah Dessen via audiobooks from my library’s overdrive app. This means that I, a fast talker and faster reader, and listen to audiobooks at 2X and everything is lovely and happy. However, my library does not have all of her books via the app and this means I have to go old school and listen to it on CD. HOW DO I LIVE?! I don’t know. But really, I’m joking. I don’t mind listening to audiobooks on CD and in my car. But I realized while listening to Just Listen is that it is almost painful for me to listen to it at normal speed which ultimately effected my enjoyment of this novel. The narrator seemed to draw it out and make it try to go on forever, and not in a good way. There are multiple books that I’ve read that if they were to go on forever I would have hearts in my eyes. This was not one of them. That is part the narration and part the story. I have wrote and re-wrote this review multiple times and each version ends up with the same “meh” feeling about the book. I am not sure if that comes from my problem with the narration, or the book in general, but ultimately it didn’t work for me. Just Listen is the story of Annabel, a girl who lives in a glass house where everything looks perfect. Of course, as everyone knows, looks can be deceiving. Her life is not remotely perfect. Annabel and her two sisters are models, the girls who have everything, but they aren’t. Her one sister is anorexic, the other one “ratted” her out and Annabel found out that she officially has no one in her life. She’s lost all of her friend(s), her mother has been dealing with depression for quite sometime now, and Annabel has never felt so alone. Annabel doesn’t talk to anyone about anything. She keeps it all inside. There is a lot of information given in the first quarter of the novel between past and present and one thing is clear: Annabel keeps a lot in because she believes it is helping to keep her family together and sane. Keeping it together is clearly not healthy for her. Annabel is falling apart and the only person who is there for her, is her classmate Owen Armstrong. Owen is the mysterious bad boy that no one knows a lot about, but one day, when things fall apart he is there for her. He doesn’t push her, he just sit there. Owen also has his own background that is complicated, but he gets through it with music. Music is clearly Owen’s passion. This was not an easy book for me to read, I actually felt a lot of guilt while reading this. Annabel treated Clark horribly, in part due to Sophie. Sophie in the later years treats Annabel horribly. Or maybe she always treated her horribly and Annabel just noticed right now after sleeping with Sophie’s boyfriend. It seems that Sophie doesn’t actually care about her boyfriend, what Sophie cares about is the popularity that her boyfriend gives her. Of course sleeping with Sophie’s girlfriend turns Annabel into the social outcast. No one talks to her now. No one but Owen. Owen who encourages her to always tell the truth, no matter how hard it is. It’s not that Owen makes Annabel be a better person, but he encourages her to be her true self. While Annabel finds her true self, so do we, the reader. Not everything is what it seems, in part because Annabel refuses to speak the truth, to anyone. It took me about 40% of the novel to actually warm up to Annabel, I spend so much of the novel annoyed at her, that when I started to like her, it creeped up on me. It was unexpected and I was shocked that I began to have feelings for Annabel. I went from wanting to shake her, to wanting to cry with her. It was amazing how slow that switch occurred also. I know it wasn’t fair to judge Annabel at the beginning, but I did not find her likable or more importantly, I didn’t care about her story. She did begin to grow though, she didn’t necessarily become more likable, I just started to relate to her more and my heart began to go out of her. The story became more flushed and realistic when Annabel let her guard down and started to be honest with herself, and Owen. Something he encouraged from their very first meeting was that she should be honest, at least with herself and others. But mostly of herself. What she learns is that it is important to tell the truth, than to try and make everyone happy. This is something I still fight with on a daily basis. As many issues as I seemed to have with this novel, I ended up enjoying it. Dessen does have a way with contemporary YA, even if I was in denial about it at the time. “Ruby, where is your mother?” Ruby knows that the game is up. For the past few months, she’s been on her own in the yellow house, managing somehow, knowing that her mother will probably never return. That’s how she comes to live with Cora, the sister she hasn’t seen in ten years, and Cora’s husband Jamie, whose down-to-earth demeanor makes it hard for Ruby to believe he founded the most popular networking Web site around. A luxurious house, fancy private school, a new wardrobe, the promise of college and a future—it’s a dream come true. After I did the embarrassing mass read of New Adult fiction that ruined my brain in mass amounts, I was texting my bookbff and she was all “do you know what you need to read! ?” And that is what started my Sarah Dessen readathon. Yes. I am a 26 year old book blogger and I have never ever really read a Sarah Dessen book. I say “really read” because I believe I did a few years ago, but I have no memory of it, so I’m starting fresh! It happened to work out that my first library hold was Lock and Key and I feel that this was an excellent start into Dessen’s writing. This was a classic, heartbreaking contemporary novel. Ruby’s life has not been perfect. While she is fine with her background, she understands most look down upon. Her mother is an alcoholic who abandons her and Ruby is forced to live with her sister, Cora, and Cora’s husband, Jamie. While Jamie seems to open his arms and welcome Ruby into the family, Cora is a bit standoffish and Ruby just wants to go back to normal. Cora has a fancy perfect life and this is not what makes Ruby comfortable. While, to the reader, Ruby’s life hasn’t been remotely comfortable, it has been comfortable to her and she did not want to face the change of this new perfect life. Ruby misses the old Cora. The Cora who wasn’t trying to save the world, but instead save Ruby, but Ruby hasn’t seen Cora since Cora went to college and it’s been years. Why did Cora stop caring about Ruby? They were so close. 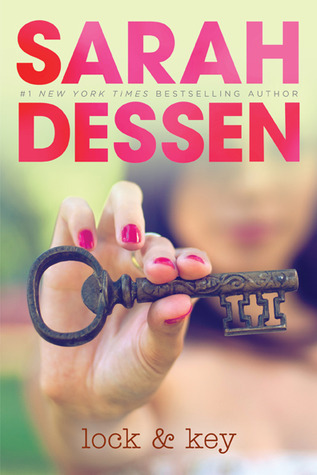 What Dessen does in Lock and Key is dissects familiar relationships and even personal relationships. Ruby doesn’t want to get close to anyone. People in her new school, Jamie and Cora, Nate, the boy next door. Anyone. Because she’s just going to be here until she’s 18 and then it will just be her again and that is what Ruby wants. 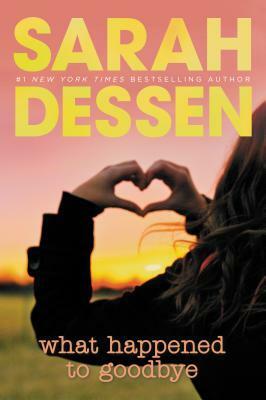 What Dessen does is create a realistic story about what family is and what it means to be yourself. Ruby is of the belief that her sister, who is ten years older than her, wanted nothing to do with her once she went to college. Ruby even understood and didn’t blame Cora, Ruby blamed herself. Through time, and talking, what the two find out to understand is that what they have known for quite sometime, is that parts of their lives have been a lie. The first day Ruby is there, she wants to flee. Fight or flight often has her wanting to flight. It’s easier for her. What she learns though is that if she would flight, there is a lot she would have missed out on. Including learning more about Cora and Jamie and the fact that people change and they aren’t always what you thought, but that it can be better than you ever knew. And family isn’t always what you’re born into but what you make it. There will be spoilers for the end of the novel in this review. So with this novel, I’m continuing my education as to contemporary novels. Laurie Halse Anderson had the longest line by far at ALA in Chicago, and it seems everyone loves her books. I thought I’d love this one too, in the beginning, but that ended up not being so. Disclaimer: I have never had an eating disorder, nor do I know anyone who has, at least not personally. And at first, I sympathized with Lia, caught in a storm of self-hatred, cut off from her family and her best friend. And in the case of the latter, Lia is cut off forever, because Cassie is dead, done in by bulimia. Lia is anorexic and somewhat high and mighty about her ability to abstain from food, while Cassie chose to binge and purge. At the beginning of this novel, Lia is just out of recovery, but she is not recovered. She is living with her permissive father and his new frazzled wife. She constantly considers the calories in things she’s eating and sometimes gives pretty gross detail to the distortions she’s seeing in food and in her body. Lia does a lot of describing what it was like before her disorder, how her friendship with Cassie progressed then ended, and how Lia’s relationship with her parents deteriorated. The beginning hooked me, and I thought Anderson did a good job presenting the material. After that, though, I started to get tired of the writing style. It’s almost lyrical sometimes, kind of poetic, and that’s generally not for me. I skimmed near the end due to wordiness. I was also very frustrated because being in Lia’s head made it harder and harder to sympathize with her. In the end, she considers everyone the enemy, is wasting away, and no one even notices. Her father failed really badly here. I found myself really pissed at him throughout the novel and identifying more with her mother. The methods in this book of trying to force Lia to eat seemed suspect too. Yelling at her and shoving food in her face is almost guaranteed to not help, and it doesn’t. Lia only gets worse. There is also a vague romantic storyline that I won’t even detail because I found it extraneous and forced. In the end, it means nothing anyway. And in the end, Lia is carted off again, not because she recognizes that she has a real problem, but because she almost bled out in front of her stepsister. Any time a person is forced to better themselves for the sake of others, it does not work. You have to recognize your problem and fix it because you want to, otherwise you will rationalize yourself right back into your problem. I might not know eating disorders, but I know addiction, and Lia’s thought processes were similar. I had a hard time identifying with and sympathizing with Lia, and this affected my enjoyment of the book. I wish we’d been in Cassie’s head, who seemed more interesting, personality-wise. I thought the basis of Lia’s recovery was shaky at best. However, I do think this is a defining novel, because at least someone is talking about it, and at least people living with ED have voices in the mainstream, even if those voices must be facilitated by those who only know their pain through research. Source: Reblogbookclub on Tumblr, via the publisher. I was lucky enough to read this book for reblogbookclub, on tumblr. Which is genius and I could not recommend more. That being said, even after talking about the book on tumblr, I still wanted to talk about the book. This is the story of Hayley, who has not had an easy life. Her father, is a solider, who returned from Iraq quite different than he was before Iraq, understandably. Andy has PTSD, there is an argument going around tumblr and goodreads if this was a textbook case of PTSD, or a downplayed version of PTSD. As someone who does not live with PTSD, or have a relative who has PTSD, I found it easy to understand. I was able to see why Hayley had to grow up fast and why Andy was having problems getting up in the morning. I found it to be very telling and it broke my heart in multiple places, because I wanted both of them to be okay, and real life does not always work that way. Hayley deals with her home life by putting up massive walls that no one is able to work their way through. She has one best friend and everyone else, to Hayley, is a zombie. Just going through the motions of living without really living. The irony is throughout the novel, I started to question, is Hayley just a zombie herself? A girl, just going through the motions of living? Throughout the story, there are a cast of other characters. From Hayley’s BFF, to Finn, the boy who tries to get through the hard exterior. Both of whom, are fighting their own demons at home. 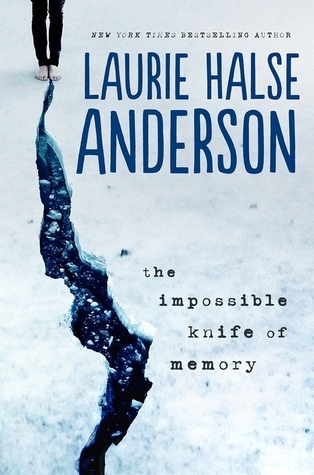 I found The Impossible Knife of Memory to be an interesting read in the fact it is so not my normal read. I am a light! fluffy! reader. I have never hidden this. So this got me to go outside my normal boundaries and enjoy something I would have normally not enjoyed. But that being said, it was not a pleasant read for me. It made me cringe, made me want to shake things and made me look outside of my normal world.